Constructed with original apple lightning connector, each build-in chip has a unique and verified serial number to ensure premium quality and 100% compatibility. the test standard we set: Bending test - over 4000 times and no change in performance; Plug test - over 4000 times and no change in performance. The ultra slim lightning connector head fits into your phone case's hole position perfectly, no need to take off the case when charging. It will not fit apple products with lifeproof case, please remove your lifeproof case before charging. 6.6 feet (2 meter) cable, extra long for use at home, car, office and more. The decent length 2 meters is perfect for your convenient and efficient daily use. 4,000 times bending test, This strong cord is made of high-quality copper core and highly protective jacket for greater reliability and longer service life. 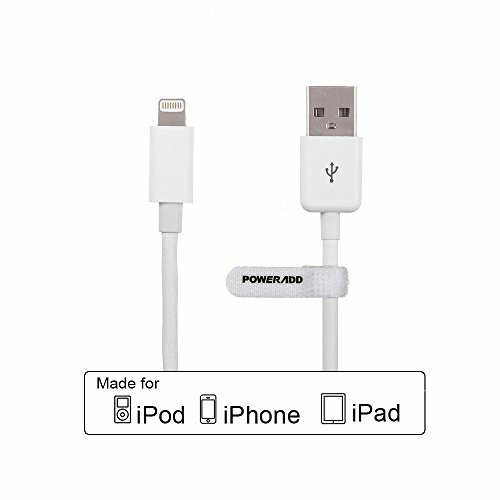 2-in-1 function: charging and syncing for your Apple devices without damaging your decices. Besides It's able to resist stretching, everyday wear and tear etc.